The ultimate gym package. It offers an enormous range of upper and lower body exercises for maximum muscular strength, total body conditioning and superior endurance. 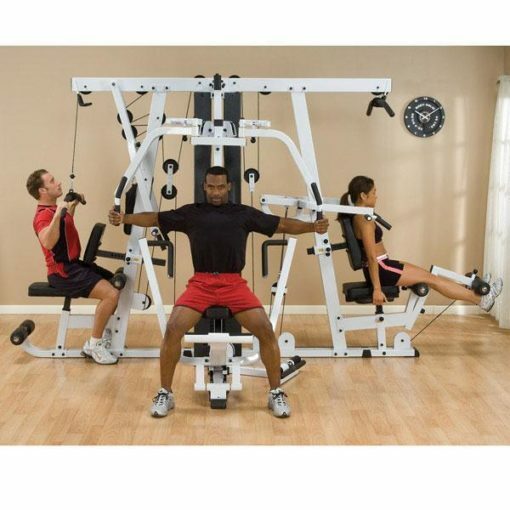 Up to four people can work out simultaneously with the optional Leg Press Station. It fits comfortably against a wall or on display in the center of the room. The exercise stations are fed by three 210 lb. steel alloy weight stacks. Unique features include a Bench Press with “kick-assist” lever for complete prestretch and full range of motion, seat pads with automatic hydraulic adjustments, easy-access pop pin adjustments from the seated positions, and DuraFirm™ pads with lower lumbar support. Comes complete with weight stack shrouds for safety, 2″ x 4″ mainframe to eliminate torsional flex, Perfect Pec™ Station with range limiters and an advanced articulating handle design for the feel of a true dumbbell workout and a tough, durable powder coat finish. Chest Press Station: Kick-assist lever allows you to move the handgrips into comfortable start and finish positions for a complete prestretch and full range of motion without straining. Triceps Press Down Station: Includes center-balanced Triceps V-Bar that allows follow through movement at optimum resistance. Shoulder Press Station: Biomechanically designed to apply full resistance onto the deltoids so you work only the muscles and not the joints. 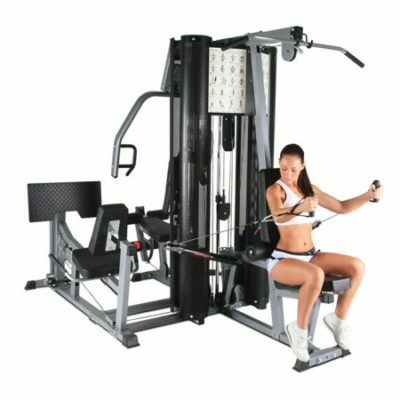 Lat Pull Down Station: Designed for optimum development of the lats, shoulders and upper arms. 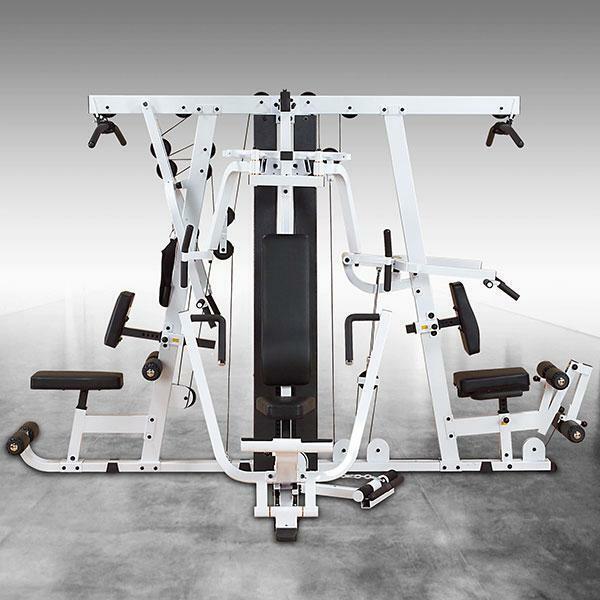 Perfect Pec Station: Dual overhead cams with six increment settings per arm provide variable starting positions and allow fine-tuning for accurate prestretch with optimal biomechanical movement. Ab Crunch Station: This station gets results fast! You can create a lean, muscular waist with absolute isolation of your abdominal and oblique muscles. 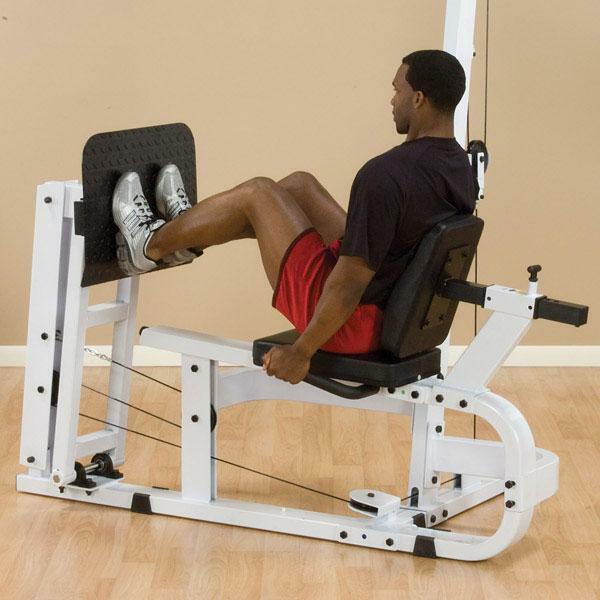 Chest Supported Row Station: Ultra comfortable and adjustable chest pad helps create a substantial lat stretch which is key for maximum back development. Three 210 Lb. Alloy Steel Weight Stacks: Advanced alloy weight stack plates employ oversized nylon bushings for super smooth operation and sound absorbing cushioning. Low Pulley Staiton: Low pulley swivels smoothly and fully to provide accurate resistance for cable curls, upright rows, shrugs, leg adduction, leg abduction and more. Weight Stack Shrouds: Full length shrouds encompass all weight stacks for enhanced appearance and improved safety. 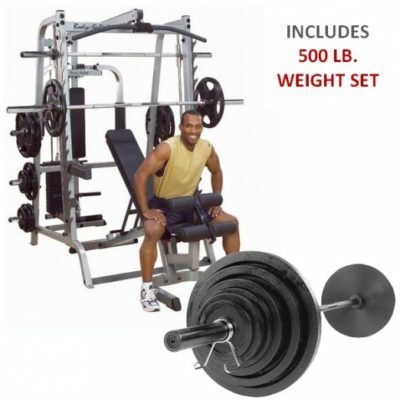 BodyCraft X4 Multi Station Commercial Gym.Call Now for Lowest Pricing Guaranteed! Bodycraft X2 Strength Training System .-New. Call Now For Lowest Pricing Guaranteed! Gympros Holiday Liquidation Event Sale! Call Now For Today's Price Drop!